The city of Cambridge is well known for its cycling, and from the 22-28th October, young volunteers were willing to offer bike repairs to anyone, as just one way to bless people as part of the Beyond Belief youth mission. Over six days of spreading love and happiness, 150 teenagers impacted Cambridge eager to share God’s love, and help the community. As they gathered on the afternoon of Saturday 22nd October they began a life-changing week of worship and local action. Groups of twenty covered the whole city. Gardens were dug with enthusiasm, community facilities were painted with creativity, youth cafes were ran with kindness, and volunteers left behind the essence of Jesus wherever they went. The community were impressed with the commitment of the young people who eagerly carried out the selfless work. Beyond Belief gives young people the opportunity to talk about God and create a lasting impact on the lives of people in their city. “It’s amazing how many young people will give up their half term to share God’s love.” said one participant. Soul Survivor and Youth for Christ supported the mission, as part of Hope Revolution. "We’re going around Cambridge spreading God’s love and doing community work" one volunteer said, proving the feeling of unity in the community. Phil Ti mson, Youth Director for HOPE, told us how he felt the week went: "Beyond Belief was incredible. 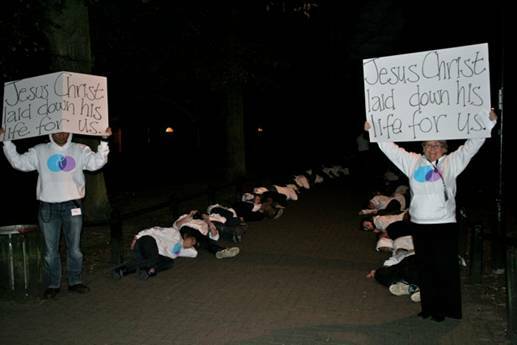 We saw so many amazing young people dare to take risks for Jesus and over 30 churches in Cambridge took part. Loads of ideas and activities have been launched from the success of this mission. I just adore young people deciding to get out of their comfort zones for Jesus. Praise God"